Objectives: To evaluate the patient characteristics, complications and outcome of renal transplantation in pediatric end stage renal disease (ESRD). Type of study: Retrospective observational analysis. Subjects: Children with ESRD subjected to renal transplantation in last 5 years (April 2007–March 2012) at Jaslok Hospital. Methods: Demographic data of the transplant recipients and donors, prior dialysis, surgical details of renal transplantation, immunosuppression, medical and surgical complications and post-transplant follow up and outcome was assessed. Results: 20 children in the age group 6–18 years (mean 14.6 years) underwent renal transplantation in last 5 years at our hospital. Fifteen percent cases (n = 3) weighed < 20 kg at transplantation. Primary cause of renal failure was glomerular in 30%, tubulo-interstitial in 45% and unknown in 25%. All were primary transplants, pre-emptive in 15%; live related in 95%, cadaveric in 5%. Mothers were the kidney donors in 60% cases. Induction therapy was used in 60% while maintenance therapy comprised of triple regimen. UTI was the commonest surgical complication (40%) followed by perinephric collection (20%), lymphocoele (15%) and renovascular thrombosis (10%, associated with graft dysfunction). 15% cases experienced graft rejection (acute cellular rejection (ACR), 66.6% and antibody mediated rejection (AMR), 33.3%) with complete renal recovery following treatment.73.4% and 72.8% cases had functioning grafts at the end of one and three years respectively. Conclusions: Pediatric renal transplantation was associated with 100% patient survival and is a safe therapeutic option for children with ESRD. Background: Decreased serum levels of trace elements seen in long-term hemodialysied patients, suppress immune system. The aim of this study was to find if any changes occur in trace elements after transplantation and assess the correlation between post-transplantation renal function and levels of trace elements. Methods: Long-term hemodialysied patients with underlying ESRD were divided into two groups, who were undergone transplantation (n = 54) and were not (n = 69). Levels of lithium, magnesium, iron, zinc and copper measured 24 h before and three months after transplantation in both groups. The transplanted patients' serum levels of creatinine were assessed at same intervals as an indicator of graft function. Results: 54 patients, 18 men (33%), 36 women (67%) with mean age of 47.67 ± 14.33 years underwent transplantation between April 2010 and April 2011. While serum iron (p < 0.001) and copper levels (p < 0.001) significantly increased after transplantation, there was a statistically significant reduction in magnesium levels (p < 0.001). No significant differences were noted in zinc (p = 0.17) and lithium (p = 0.080) levels in comparison to control group. A significant relationship was noted between levels of magnesium (p = 0.015) and zinc (p = 0.025) and creatinine within three months after transplantation. Conclusion: Our study showed transplantation alters serum levels of trace elements in long-term hemodialysied patients with underlying ESRD and affects immunity and the results of renal function (Cr levels). 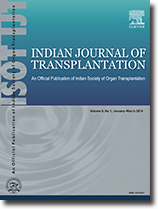 Introduction: Donor morbidity is of prime concern in living donor liver transplant (LDLT). Several centers in India have reported outstanding outcomes of LDLT. This study intends to reiterate the importance of donor safety in liver transplantation. Aims and objectives: To review the outcome of donor hepatectomies in LDLT at our center. Materials and methods: This study retrospectively analyzes the outcomes of 34 consecutive living donor hepatectomies performed between Apr 2007 and Jun 2013. Complications following major donor hepatectomy were stratified according to Clavien classification of postoperative surgical complications. Results: Nine living donors had perioperative complications. Grade 1 complications were most frequent (20.6%); grade 2 in 6%; while none had any higher grades of complications. No donor mortality was present. Conclusion: Meticulous preoperative donor selection criteria and adherence to predefined surgical protocols can ensure minimal donor morbidity. Introduction: Pheohyphomycosis is a pigmented fungus which can present as an isolated brain abscess in both immunocompetent and immunocompromised individuals with almost similar mortality in the two groups. In brain, cerebrum is the usual site of involvement. Case report: We present a case of isolated cerebellar pheohyphomycosis in 48-year-old male diagnosed on histopathological examination. Patient was on immunosuppressive medication as he had received combined hepatic and renal transplantation. Discussion: Isolated cerebellar involvement is extremely uncommon in pheohyphomycosis. These fungi have melanin pigment present in their walls which helps them in evading host defence. Tissue for performing fungal culture may not be always available in brain infections as biopsy tissue is not routinely sent for culture in unsuspected cases. In these patients histopathological examination with special can serve as a useful in identification of fungal species and can be life saving for the patient. Cryptosporidium infection can present as refractory diarrhoea in solid organ transplant recipients. Many drugs have been shown in vitro activity against cryptosporidium. Optimum therapy to treat a clinical infection with cryptosporidium is not known. It is often difficult to achieve parasitological cure and this may require reduction of immunosuppressive drugs coupled with antiparasitic agents. Nitazoxanide is a thiazolide antiparasitic which is currently approved for treatment of cryptosporidiosis in immunocompetent persons aged above one year. There are no guidelines for the treatment of cryptosporidiosis in solid organ transplant recipients. We report our experience of extended treatment with Nitazoxanide and Azithromycin for two post renal transplant patients with cryptosporidium diarrhoea which resulted in clinical as well as parasitological cure. Invasive fungal infections are associated with morbidity and mortality in immunocompromised patients. Infection of rhinocerebral region are mainly due to opportunistic fungal pathogens. Although zygomycosis and aspergillosis are two major causes of paranasal infections, reports of combined mucormycosis and aspergillosis infections of rhinocerebral region are limited. We report a case of combined rhinocerebral fungal infection in post renal transplant diabetic patient. Identification of two fungal pathogens helps in appropriate management of patient with clinical cure. Pneumocystis carinii pneumonia is an infection observed in immunocompromised patients. The risk of infection depends on the intensity and duration of immunosuppression and underlying immune deficits. Prophylaxis with trimethoprim-sulfamethoxazole prevents opportunistic infections due to Pneumocystis carinii, Toxoplasma gondii; in addition to preventing community acquired respiratory, gastrointestinal, and urinary tract infections. The usual presentation of P. carinii is during the first three to six months after transplantation at the peak of immunosuppressive therapy. We describe a case of Pneumocystis jirovecii pneumonia in a renal transplant recipient 38 months after renal transplantation. Avascular necrosis of the femoral head is one of the most common skeletal complications among renal allograft recipients complaining of hip pain. While bilateral avascular necrosis is more frequent than the unilateral type, we report a case of unilateral avascular necrosis of the hip occurring post renal transplant recipient. Avascular necrosis was likely the result of steroid therapy. A well-tailored steroid therapy that prevents unjustified high doses and ‘pulsed doses’ while maintaining the optimum maintenance level of steroids is necessary.